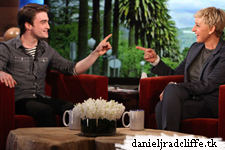 Daniel appeared on The Ellen DeGeneres Show where he ofcourse talked about The Woman in Black and Ellen tried to scare him but he also made a bet with Ellen about the Super Bowl, and whoever loses will donate $5,000 to The Trevor Project. Update: 4th February 2012. A video from the bet with Ellen is below. Update: 23rd February 2012. Daniel did win, so Ellen will pay $5,000 to the Trevor Project.